WANAQUE – Coming into this season there were questions aplenty for the Lakeland girls’ basketball team. Would center Allison McBride be able to return from a torn ACL suffered in last year’s Passaic County final? Could Kiera Marks raise her game on both ends of the floor? How would a new supporting cast adjust to big games on the varsity level? 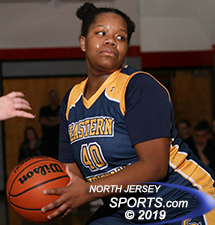 After falling short in the last two Passaic County finals, the Lady Lancers are determined to answer those questions in a positive way. Facing a short-handed Eastern Christian, Marks got off to a hot start and her teammates followed her lead. The top-seeded Lancers played as a unit defensively throughout in cruising to a 42-24 win over the ninth-seeded Eagles on Saturday morning in the Passaic County Quarterfinals in Wanaque. Despite playing without standout forward Madison Wynbeek, Naomi Englehard hit a free throw then scored inside to put Eastern Christian up 3-2 near the midway point of the first quarter. After Lakeland grabbed the lead, Christina Tartini hit a shot off the glass to cut the lead to 7-5. That is Marks took over hitting all four of her shots, including a three-points for nine points in an 11-2 run. Naomi Englehard scored the first three points of the game for Eastern Christian. Tartini hit a three to open the second quarter. On the ensuing possession Marks answered with a long-range bomb of her own to bump the lead back up to double-digits, where it remained for the rest of the game as Lakeland was firmly in control by halftime with a 28-12 lead. The second half was of the same with Lakeland forcing tough shots and causing turnovers to set a tone that lasted from the opening tag to the final buzzer. Marks filled the box score with 20 points, five rebounds, four assists, and two steals for Lakeland (15-5). Ashley Davidson had one of her best games of the season with nine points and five rebounds. Kaitlyn Collins had game-highs of six assists and four steals to go with four points and four rebounds. Ashley Davidson had one of her best games of the season with nine points and five rebounds for Lakeland, which improved to 15-5 on the season. Tartini led Eastern Christian (10-11) with eight points. 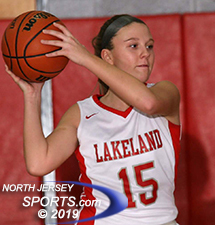 With Saturday’s win Lakeland advanced to the Passaic County semifinals. The Lancers will take on fifth-seeded DePaul, who erased an 11-point halftime deficit to beat fourth-seeded Hawthorne (45-42). That game will be played at Paterson Kennedy High School with a 1:00 P.M. tip-off. Looking up at the girls’ basketball banner in the Lakeland gymnasium, Marks and her teammates see every day that the only county title in the program’s history came in 1994. Now on a six-game win streak and having won 10 of their last 11 the Lancers are ecstatic about the possibility of playing in a third straight Passaic County final.